Robert J. Sawyer » Blog Archive » Door prizes for Toronto launch party! Door prizes for Toronto launch party! by Rob - February 29th, 2016. And — super-rare! 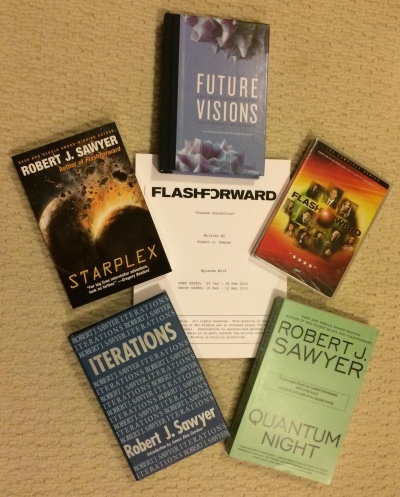 — a copy of the first draft (my preferred draft) of “Course Correction,” the episode of FLASHFORWARD I wrote. Each one is a separate prize. I’ll happily autograph prizes for the winners. Hope to see many of you tomorrow! The event is free and open to the public; everyone is welcome! 2 Responses to Door prizes for Toronto launch party! Congratulations on your new publication, Robert! I read the first 3 chapters and got hooked. I might be able to include at least a section of your new novel in my SF course this summer. Sadly, I am teaching tonight, so short of cloning myself, I cannot be in both places at once. I elected to attend the Halifax launch party for QUANTUM NIGHT. It consisted of me driving to Chapters, buying QUANTUM NIGHT, driving home, and deciding not to start reading because I had to get up for work the next day. My exclusive door prize was left for me, just inside the front door, by the cat. Thanks for nothing, you furry little jerk. Exciting times! I think I’ll start the novel after supper tonight.